The Rust Belt is losing its red tint. It has been more than 40 years since Indiana voted for a Democrat in a presidential election, but discontent among the state's auto and manufacturing workers has them supporting the Democratic Party and Obama this election season as the best hope to save the industry. Danny, who didn't want to give his last name for publication, is a retired GM autoworker living in Anderson, Indiana. "Before, nobody really paid attention to Indiana," he says. But "there's more activism on the ground right now," and he predicts the state -- a onetime stronghold of the Ku Klux Klan -- will go blue in November. His prediction is supported by recent numbers. In 2004, President Bush crushed Sen. Kerry in Indiana, winning 60 percent of the vote to Kerry's 39 percent. By contrast, a June 24 SurveyUSA poll showed Sen. Obama actually leading Sen. McCain 48 percent to 47 percent, a toss up, given the 5 point margin of error. Danny retired in Oct. 2003 after working for GM for 33 years. In that time, he's seen one of America's largest plastics manufacturing facilities shuttered and closed, thousands laid off, and the local economy devastated. In 1970, roughly 70,000 people called the then-thriving manufacturing city of Anderson home. Today, that figure stands at 59,000 and falling. "It's just gonna keep on going down," says Danny of his former employer. As reported July 10 in Fortune, GM's market value is less than the value of Bed Bath & Beyond. A July 15 piece in Fortune on GM's recently announced restructuring plan carried the headline "[CEO] Rick Wagoner Tries to Catch a Falling Knife -- and Fails." Perhaps no state has suffered the trauma of the American auto industry's fall more than has Michigan. Feller Galaviz, an electrician who has spent the past 13 years working for GM in the state, recently relocated to Arlington, Texas, to keep a job with the company. According to Galaviz, many younger tradesmen and women are getting paid higher wages to abandon his trade to work instead on the manufacturing line side by side with seniors. "They've put their trade guys on the line," he said, "and that's created animosity -- especially with the old-timers." Like Danny in Indiana, Galaviz sees the trauma of the industry favoring Obama in 2008. "I think pretty much the majority is going for Obama," he said. "I think there's a real desire for change. We have the capability to transform the industry." Danny agrees, adding that "The [American automakers] had the technology to [make change] for 5-10 years, but they haven't done it. For God's sake, they sit there and say, 'We need change, we need change,' and they don't do it." 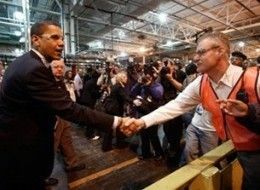 The United Auto Workers union endorsed Barack Obama on June 10, and the union website contains rave reviews of a visit he made to Flint, Mich., last month. It's possible that no other city in America has suffered more for the GOP's misguided trade policies, inattention to the nation's infrastructure, and lack of a national health care plan. Those problems were on the minds of many UAW members in the crowd when Obama delivered his speech on Monday to rousing applause and numerous standing ovations to about 1,000 people at Kettering University's Connie and Jim John Recreation Center in Flint. Both Danny and Feller Galaviz say they thought the unions were more engaged this election cycle than in years past, but they are skeptical of the effectiveness of the unions. "The [union people] seem to have confidence," says Galaviz. "But we have no confidence in the union. We feel they're floating us down the river." Even if the industry were to right itself, Galaviz predicted, the union system "will be demolished." "It's going to be every man for himself." As of publication, a call to the U.A.W. International office in Detroit was not returned. "Anybody in their right mind -- even the U.A.W. or any other union," says Danny, "knows that in order to succeed, you have to make money.... It all comes down to the elected officials." Of Indiana politics in 2008, he says, "The people that know where their bread comes from -- they'll fall in line." "It's ridiculous," says Danny. "No new American refineries since the 1980s." The disgust is evident in his voice. "It's not just the auto industry," he says. "It's every industry. Corporations, he says, have used American military intervention abroad "as an excuse to move overseas." "I don't see GM changing anything until they have every operation overseas," says Danny. "This started back in the 1980s with Reagan." Midwest autoworkers are especially frustrated with NAFTA, he says, calling the trade agreement, health care, and national security the three issues foremost on autoworkers' minds in 2008. "We already know we're not going to get any help from McCain," Danny says. "And I don't even know what Phil Gramm thought he was talking about last week." Whether or not GM will survive to see what Galaviz and Danny see as the benefits of political change is unknown. On Tuesday, GM Vice Chairman Bob Lutz said that the automaker will "need triples and home runs" if it is to regain market viability in 2009. GM recently put its gaz-guzzling Hummer brand up for sale and is focusing efforts on the development of smaller, fuel-efficient compacts. GM executives are touting the Chevrolet Volt -- an extended range electric car slated for release in 2010 -- as a potential savior. "Everybody's betting on that," said Galaviz, who seems cautiously optimistic. Danny is more skeptical. "We are too far into oil," he says. "We had a lesson in the 1970s. Brazil learned from it," Danny notes, of the South American country's progressive alternative fuel program. Brazil achieved energy equilibrium in 2006 -- exporting as much oil as it imports; and the country is a leader in ethanol use and flex-fuel infrastructure. According to Danny, though, in the United States, "All we did was sit back for a little bit and do nothing." Now, he says, "It's getting close to being a perfect storm." At a speech in Des Moines in which he recounted a recent visit to automakers in Detroit, Obama said, "I told them that when I am president, there will be no more excuses -- we will help them retool their factories, but they will have to make cars that use less oil." Obama has further stood in opposition to McCain's proposed "gas tax holiday" and opposed opening protected coastal waters to offshore drilling. "We got to have a Democrat in the White House this time around," says Danny.